As we all get older and our vision ages, many of us find lighting to be increasingly important and sometimes problematic. Personally, my vision is healthy, but I find myself turning on more lights to accomplish tasks and night driving has become a little more challenging. This month’s post is about how the right kind of lighting can be helpful for someone with declining vision. We all see the world differently, so good lighting is different for each of us. I recently asked NABA’s Certified Vision Rehab Therapist (VRT) Christina Kendall for her thoughts on this topic. VRT’s help people find the right lighting, as well as offer low-vision adaptive strategies and creative solutions for independent living with declining vision. Kendall said that she is often asked about what kind of lighting people should I buy for their home. This question is understandable, as many people with low vision need increased lighting to be more effective with their various daily tasks. The answer to the question, however, is a bit more complicated. First of all, not everyone’s vision is the same. Some people, depending on their eye condition, need as much light as possible (often true with macular degeneration), whereas others are glare-sensitive (i.e. those with cataracts or glaucoma). Some people are able to function more effectively with artificial light, whereas other people are able to function more easily using natural light. It is first best to observe someone under different lighting conditions and decide which types of lighting the person seems to benefit from most of all. For example, do they prefer to sit by a window to read, or do they prefer to sit under a floor lamp? Are they pulling down the blinds because of the outdoor glare, or are they turning on all the lights in the house claiming it is too dark? Next, find out what kinds of tasks the person is trying to accomplish. For example, is the person trying to illuminate an entire room or a smaller work area? I believe a helpful place to start is comparing the differences between the common types of bulbs available and the tasks for which they would be most useful. 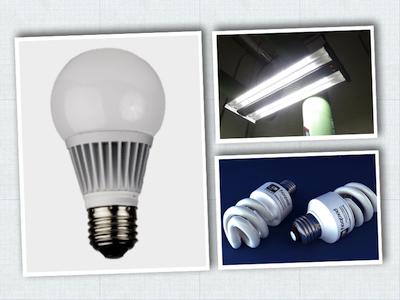 LED Lighting: This is known as the 21st century bulb. The benefit of these bulbs is that they can be lifelong bulbs (ranging around 25,000 hours of power or more), so people with balance issues do not have to risk frequent climbs on the step ladder to change them. They produce a bright white light with reduced glare and are often used now in high-quality magnifiers. They are generally very helpful for reading activities for people with macular degeneration. LEDs produce instant light, so they are excellent for stairwell and hallway lighting at night, as you don’t need to wait minutes before it is bright enough to walk. They can also be used with a dimmer-switch, enabling someone working in a kitchen to control the lighting more effectively over a food prep area or dining table. This is especially helpful for folks whose vision fluctuates, as is often the case with diabetic retinopathy. Finally, LED bulbs do not contain mercury, making them a cleaner, healthier bulb for people and the environment. Incandescent or CF (Compact Fluorescent) Bulbs: These bulbs do not last as long as LEDs, but are less expensive. They are efficient for a small area such as a desk area for reading and writing tasks. They can be purchased in various wattages for desk lamps making them a good consideration for people who have macular degeneration who need close task lighting. Also, consider a white lamp shade for desk and floor lamps to illuminate the area desired. Purchase goose-neck style lamps which will provide more control with the direction of the light. They can also be used in higher wattages for ceiling lights to brighten up a room. Full Spectrum Bulbs: These bulbs cover a wider spectrum of light wavelength and are excellent for enhancing colors. Full Spectrum bulbs are often called “the closest thing to natural light,” and are best used for tasks such as artwork and crafts which require accurate color identification. These bulbs are helpful for people with retinal damage (macular degeneration or diabetic retinopathy) which has affected color vision and who need more light. Many large stores are often illuminated with fluorescent lighting which throws a great deal of glare. When in stores or other areas where one cannot control lighting, wearing a hat with a brim can help reduce up to fifty percent of the glare often caused by large-scale commercial lighting. Therefore, when considering lighting, consider the individual and consider the task. The right kind of lighting can have an enormous impact on someone and can assist them in maintaining their independence and success with life’s varied activities. Cheryl F. Lawyer is outreach coordinator and community education coordinator for the Northeastern Association of the Blind at Albany (NABA). She is also sight committee chairperson for the Saratoga Springs Lions Club and a member of the American Council of the Blind. You can reach her at (518) 229-5986 (cell), or via email at clawyer@naba-vision.org.